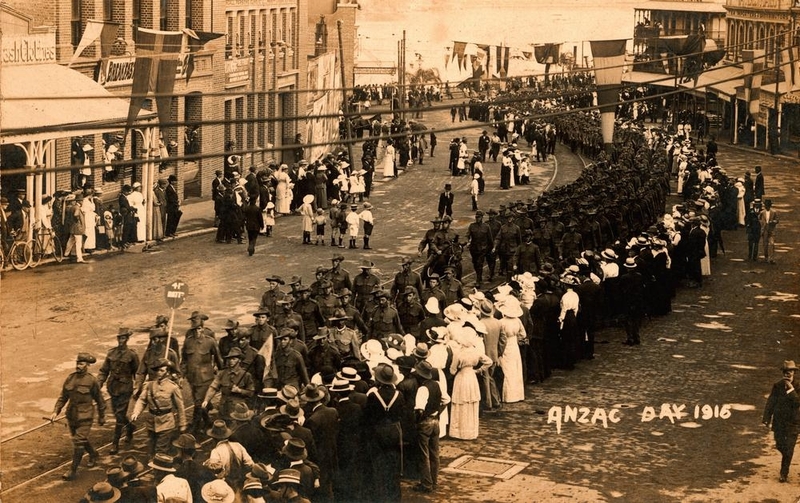 Procession of the 41st Battalion through Brisbane on Anzac Day, 1916. Image source: State Library of Queensland. The one day of the year in Australia is Anzac Day, April 25, a national public holiday commemorating all those who have served and died in war. April 25 is the anniversary of the landing at Gallipoli of the Australian and New Zealand Army Corps (ANZAC) troops in 1915. It was the start of a gruelling eight-month long campaign by allied forces during the First World War to capture the Turkish peninsula. More than 8000 Australians died at Gallipoli, and it made an indelible mark on the nation’s psyche. The following year, in 1916, April 25 was officially designated Anzac Day. It was marked by ceremonies, religious services, and marches (such as the one pictured above in Brisbane) to honour those who had fallen. A number of Australian terms grew out of the Gallipoli experience. Some have emerged directly from the commemoration of Anzac Day: Anzac service and Anzac march (first recorded 1916), Anzac parade (1917), and dawn service (1929). Other compound words formed on ‘Anzac’ are Anzac tradition (1916), Anzac biscuit (1917), Anzac weekend (1920), Anzac legend (1930), and Anzac myth (1959). The phrase the one day of the year is first recorded in the 1916 poem above. It evokes a time when Australians were coming to terms with the horrific losses suffered by a new nation with a population of less than five million (Australia had been formed out of 6 colonies only 14 years earlier). The Gallipoli campaign is said to have been instrumental in forging an Australian identity, and Anzac Day is regarded by many as the most solemn and significant of the nation’s anniversaries. While these ideas and attitudes have sometimes been questioned (notably in Alan Seymour’s 1960 play The One Day of the Year), there is no doubt that this day continues to play an important role in Australian culture. This entry was posted in ANDC, war and tagged Anzac biscuit, Anzac Day, Anzac legend, Anzac myth, Anzac parade, Anzac service, Anzac tradition, Anzac weekend, dawn service, one day of the year by Mark Gwynn. Bookmark the permalink.